The book has three parts: The universal theme of the image of God, the particular theme of holy nation and a third part explaining his theory of halakhah as dealing with these opposite poles. The first part is Biblical theology of the universal ideas of Genesis. His casts his net widely for sources. First, Yair Lorberbaum’s important work on image of God showing that on this topic the aggadah influences the halakhah of Maimonides and Nahmanides. He also uses Judge Hayim Cohen, Nachum Rackover, Moshe Greenberg, and Ruth Gavison. He also uses Emmanuel Levinas’ universalism and his moral reading of Rav Hayyim of Volozhin. He also was influenced by the Shalem Center’s view of political Hebraism that many of the great liberals and humanists of Western culture used and based themselves on the Bible. The second part is theology of the particular holiness and specialness of the Jewish people given at Sinai. Here he starts from Yehudah Halevi, Ibn Ezra, Daniel Elazar, and the Biblical studies of Moshe Weinfled and moves to the universalism of Levinas and French Rabbi Leon Ashkenazi, known as Manitou. For those who never read, Manitou, Rabbi Ashkenazi was active in interreligious encounter and was a perennialist who saw a common primordial core of monotheism and morals to all religions, based on Abraham of monotheism and morals. “The Bible of the Jews and the Christians is the same Bible. . . It is not the Jewish and Christian Bibles that oppose one another but rather the Talmudist and the Evangelist.” The chapter concludes with a review of the sweeping uses of the Meiri on other faiths. The third part his theory of halakhah of how to resolve the tension between universalism and particularism, modern social ideas and halakhah. Brandes expects the halakhah and only the halakhah to resolve these tensions. The halakhah express both sides of these tensions as a dialectic, as complexity, and even indeterminacy, but the halakhic decider resolves the tension by deciding the law based on values. This is the most original part of the book when Brandes claims that even if you think the halakhah is a formal discipline based on texts, the decision making process behind the pesak is always values based, aggadah and mahshavah based. Judaism is not about rights but about values, and deciding between values. Hence both poles in the tension are part of the law – universal and particular, feminist and non-feminist, democratic and anti-democratic. Yes, humanism, human rights, feminism are in the halakhic texts as well as their opposites. This is the principle of Elu veElu. Halakhah itself is a value (and aggadah) driven enterprise. One chooses to respect the universal human rights or one feels that in this instance one does not. In some ways, Brandes reminds the reader of Rabbi Eliezer Berkovits- Biblical theology, defense of Jewish particularism, and value driven halakhah- but without the sense of inevitable historical progress. Halakhah is not a formal reading of responsa as common law but reading the basic texts with values and working through the dialectic. Brandes claims that just as the Chofetz Chaim didn’t invent lashon hara but he expanded its realm by saying that “prior ages did not have all the material collected.” So too Brandes, claims he is just collecting the material. In the Hebrew book reviews, Isaac Geiger write a positive review and Hillel Gershuni is more ambivalent about the murkiness and seeming cherry picking. Also where is this checklist of Jewish values, some of things discussed do not seem internal to the system. The second part concludes with a discussion that despite the humanistic sides of the halakhah that nevertheless to maintain our particular faith a heretic or sectarian can be put to death. My question is that when speaking of human rights and liberties one’s system either accepts religious liberty or it does not; it is an absolute monarchy or a democracy, it is a theocracy or it isn’t. Despite his citing Locke, Mendelsohn, and Kant – on tolerance, religious liberty and democracy- these authors saw tolerance as all or nothing, not situational. However, in the introduction Brandes states that the anti-liberal, particualrist Rabbi Eliezer Melemad and one of his students approvingly read over the book. This may prove his point that despite Locke whether to be democratic or not in Religious Zionism is a matter of values of the halakhic decider. 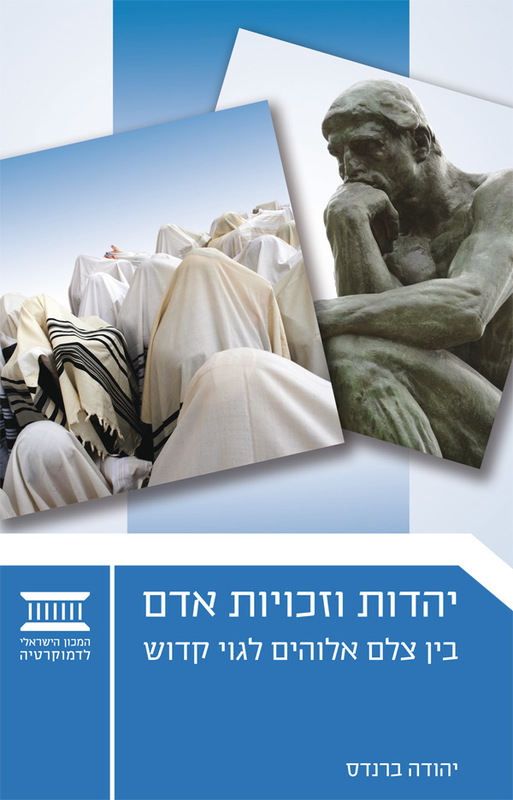 What is the relationship between Judaism and modern discourse on human rights? The short answer to this question is that the humanistic and liberal values that underlie modern human rights discourse are not foreign to Judaism. Quite the contrary: they exist within it and emanate from it, in the Bible, halakhic literature, and modern religious philosophy. The book of Genesis, especially the story of the Creation, is the wellspring of fundamental human principles. The creation of human beings in the image of God serves as the starting point from which primary values are derived. These include human life, human dignity, property, equality and freedom, and the family. Many precepts originate from these fundamental values. The value of life, first mentioned in the Bible in the verse “Whoever sheds the blood of man, by man shall his blood be shed” (Gen. 9:6), leads to injunctions such as “You shall not murder” (Exod. 20:13) and “Do not stand idly by when your neighbor’s life is threatened” (Lev. 19:16). The values of equality and freedom stem not only from the fact that all human beings were created in the divine image but also from the fact that they are all descendants of Adam and Eve; the corollaries of these values include the laws of labor relations, which mandated fair and equal treatment of workers by employers even in societies that practiced slavery, and are all the more applicable in our own day and age. and blessing, “Be fruitful and multiply, and fill the earth” (Gen. 1:28, 9:1). These are the underpinnings of many laws related to domestic and family law. The terms “values” or “principles” should be preferred to “rights,” because the Torah outlook includes precepts and obligations. The right to life and dignity comes with a concurrent obligation to defend and respect the lives and dignity of others. In some cases, the point of departure is one person’s right; in some cases, the other person’s obligation. To put it another way, the term “values” is better because it includes both rights and obligations, without specifying a fixed and absolute primacy of one or the other. Values require limits when the rights of one individual collide with the rights of another, or when one value clashes with another value. The Bible is not naïve or innocent; or, in the formulation of the philosopher Emanuel Levinas, Judaism is “a religion for adults.” The Bible recognizes the existence of human needs and impulses that lead to failures to maintain these values and to guarantee rights for all. What is more, there is an essential difficulty here, which stems not from sin and evil but from the natural and inevitable confrontations between the values and rights themselves. Dealing with the contest between competing rights and values of individuals and human societies, requires the application of tools for rendering decisions in situations that are questionable. The characteristic instrument developed by the Oral Law for his purpose is Halakhah. Halakhah is supposed to provide the rulings when values collide. The universal dimension of the Torah is found in the book of Genesis, which contains ethics that were given to all human beings descended from Adam and Noah. This constitutes the ground floor, the basic values of the Torah and Judaism, parallel to the modern system of human rights and hardly different from it in any essential way. The next level, designated “a kingdom of priests and a holy nation” (Ex. 19:6), represents the dimension of the selection of Israel to bear a special divine mission. The concept of a “kingdom of priests and a holy nation” obligates the Jewish people to observe an additional and much broader set of precepts than the basic and universal code constituted by the “Seven Noahide Commandments”; even though this code actually encompasses much more than seven precepts, the Torah imposes on the Jewish people an extremely comprehensive canon of statutes that are not incumbent on other nations. The notion of the added sanctity of the Jewish people, which accompanies the supplementary precepts, rights, and obligations that apply only to them, undermines the principle of equality—not only by creating a distinction between Israel and the nations, but also by introducing gradations within the Jewish people, as, for example, between the kohanim of the priestly caste and other Jews (“Israelites”), or between men and women. The value attached to intimate relationships and marriage must give way to the prohibitions related to forbidden unions and holiness: the ban on a kohen’s marrying a divorcee and the problematic status of agunot (wives whose husbands have disappeared), mamzerim (the children of forbidden relationships), and mesoravot get (women whose husbands refuse to give them a divorce) are examples of situations in which the notion of the sanctity of marriage takes precedence over the discourse of the right to participate in an intimate relationship. The two tracks are presented not as merging but as colliding—the track of the “image of God,” which is the basis of human rights, and the track of “a kingdom of priests and holy nation,” which constrains and limits universal human values. How do the Torah and Halakhah deal with the tension between these two tracks or two opposing systems for living? The fundamental axiom is that we are not dealing with tension and contradiction between the Torah and some external and alien culture, but with an internal tension that stems from the existence of two principles that coexist within the Torah itself. Dealing with and resolving these two opposing poles is the very soul of talmudic thought. It is based on the notion that “both these and those are the words of the living God” (BT Eruvin 13b): both of these contradictory positions are valid and true, and no final and absolute decision can be rendered in favor of one or the other. The disagreement will persist and any decisions will apply only to particular cases, as a function of the circumstances. Some are one-time rulings, while others remain in force for generations. This is the art of halakhic ruling as practiced by the rabbis, who have at their disposal a set of substantive and procedural tools for determining the practical Halakhah in cases of disagreement, doubt, and conflict. A typical example of this is the tension between humanity and nationalism, which can be found in philosophy, Halakhah, and even the liturgy. For example, Jewish prayers and blessings are full of references to the unique status of the Jewish people— “Who selected us from among all the nations” (the blessing on the Torah)—alongside abundant hopes and prayers for all humankind—“when all humanity will call on Your name” (from the daily prayer Aleinu). The dialectic of values is manifested in specific halakhic issues: it is forbidden to steal from non-Jews, but one need not return lost property to them—although in certain circumstances the injunction to restore lost property to non-Jews is given greater weight than the command to restore such property to a Jew. Distinctions are drawn between “repulsive idolaters” and “nations who live according to ethical laws.” The nature of the relationship between Jews and these types of people fluctuates in response to historical and cultural circumstances. The dialectic approach does not support the idea that humanistic values are meta-halakhic principles that influence halakhic decision-making, as is sometimes stated in works on the philosophy of Halakhah. In my view, universal humanistic values are part and parcel of authentic and original Jewish thought and Halakhah. Their fruitful and challenging encounter with the principle of the holiness and uniqueness of the Jewish people is worked out through the practical, concrete, and detailed efforts that are typical of halakhic discourse from the talmudic age to the present. As in every generation, contemporary Jewish and Israeli society is called upon to find anew the appropriate equilibrium between the universal and the particular, between the human race and the nation. The establishment of the State of Israel and its definition as a Jewish and democratic state place the challenge of dealing with the dialectic of “holy nation” and “the image of God” at the center of discourse about Israeli and Jewish identity today. Katmandu in Nepal is more cosmopolitan than India with goods and products in the bookstores, groceries, and restaurants catering to both Eastern Asia and Western Europe. The city is in a valley and polluted so that you see the air when you first arrive. However, it is surrounded by the beauty of the highest Himalayan mountains. A member of a group of visiting Israelis over the age of 60, said he tried to hike a Himalayan mountain with his group – hey they were paratroopers 40 years ago – and he said he needed to be bailed out by the accompanying jeep. Climbing here over a mile high is for the young. I took a cab. The local valley people are simultaneously Hindu and Buddhist, but the Tibetans are settling the mountain tops. The Nepalese tradition of Hinduism is different than that in northern India; The most notable is the Kumari Devi, the worship of a young girl. What is a devi? Why do we translate it as god (small g) when medieval Hebrew and Arabic translated the word as angel (malakhim or malkaya).They did this based on Rig Veda (1.22.20) “All the suras (i.e., the devas) look always toward the feet of Lord Vishnu.” They considered the devas as naturalistic and cosmological forces. So how do we understand a devi, when a girl is chosen to act as a devi for a few years and then become an ordinary person to get married? Symbol? Emblem? Idol? Bear in mind that in Northern India, the same tradition just has a girl dress up symbolically for one day a year for the festival of Navaratri in each major Temple and all the little girls are brought to Temple for a blessing. (Navaratri is a 8-9 day festival in which a different aspect of womanhood is celebrated each day.) But in Nepal, she is a declared a god for her entire childhood. Kumari, or Kumari Devi, is the tradition of worshiping young pre-pubescent girls as manifestations of the divine female energy or devi in Hindu religious traditions. The word Kumari, derived from Sanskrit Kaumarya meaning “virgin.”A Kumari is believed to be the spirit of the goddess Taleju (the Nepalese name for Durga) until she menstruates, after which it is believed that the goddess vacates her body. Serious illness or a major loss of blood from an injury are also causes for her to revert to common status. The veneration of a living Kumari in Nepal is relatively recent, dating only from the 17th century. The worship of the goddess in a young girl represents the worship of divine consciousness spread all over the creation. As the supreme goddess is thought to have manifested this entire cosmos out of her womb she exists equally in animate as well as inanimate objects. While worship of an idol represents the worship and recognition of supreme through inanimate materials, worship of a human represents veneration and recognition of the same supreme in conscious beings. Kumaris are now allowed to attend public schools, and have a life inside the classroom that is no different from that of other students. While many kumaris, such as the Kumari of Bhaktapur, attend school, others, such as the main kumari in Kathmandu, receive their education through private tutors.Her playmates will be drawn from a narrow pool of Newari children from her caste, usually the children of her caretakers. She will always be dressed in red, wear her hair in a topknot and have the agni chakchuu or “fire eye” painted on her forehead as a symbol of her special powers of perception. So let’s return to the original question: What is a Jewish conceptualization of this conception of divinity? Unlike the incarnation, there is no becoming flesh or human because only her spirit becomes divine. And second the infinite unknown of the Brahma is not known through her. She only represents the creative potential of the feminine. Worship of the girl is not a rejection of God the creator; it does not seem to be shituf. Hinduism assume that Brahman is attribute-less and is known through the attributes of the Ishvara and devis, but anything can be a manifestation or epiphany of the divine- any object animate or inanimate. A form of “no place is devoid of God” but not an immanent god of creation rather a manifestation,” no place is devoid of the ability to manifest some attribute of God. The first thing that comes to mind is Rav Nachman’s story “The Master of Prayer” were each human attribute when taken to extreme by a person makes the person into a God. The person with the most wealth is to be worshiped as a God since he has perfected that attribute. Next, I think Shlomo Lutzker’s introduction to Maggid Devarav LeYaakov, where the pious one is advised to see God’s attributes in the physical. When one tastes sweetness in food, then raise one’s thoughts to think of the sweetness as an attribute of God. Physical objects are to be used to raise ones thoughts by treating the physical object as a specific manifestation of a divine attribute. The analogy would work if a specific object would then be raised to manifestation status as a devi. The Ibn Ezra tradition as expressed in writers of the 14th century thought Hindus are bringing down ruhaniut. Idel has written much about this Hermetic bring down but it does not fell the same as this panentheistic anything can reveal an attribute of the divine. Is it different than a saint, Pope, or rebbe? It does seem similar to those who treat living Hasidic Rebbes as divine or at least an image to draw spiritual of a divine attribute– and they give blessed food just like the girl. Is it like a Chabad follower who says boranu about adonenu? What if Judaism had people become personified sefirot? Or what if Judaism had more prayers to angels not just machnesei rahamim but daily angelic prayers? Yet, on some level the girl remains a personified Jungian attributes. Furthermore, do the two traditions of India and Nepal, one where she is a devi and other where she isn’t, count as two different traditions? This is an important question. One of my Hindu doctors back in Bergen county has a little shrine in his office with pictures of modern rationalist Hindu thinkers and it also includes a picture of Albert Einstein. He knows Einstein is not technically a traditional deva but he is praying to the spirit of wisdom and scientific inquiry. Is it to be considered many gods or just personalities or emblems of the attribute of knowledge? What if he also had a picture of the goddess of wisdom and learning, would it change things?If YU was a Hindu institution, there would be a shrine to Maimonides, Rav Soloveitchik Reb Hayyim and the founder of the school Bernard Revel. They would offer a flower to the shrine before class, before public lectures, or exams. Would it be many gods? What if there was a three dimensional image of the sefirah hochmah, or hochmah, binah and daas?And what of a businessman with a shrine to Ganesha- the deva for prosperity- is it the same as the girl for femininity or the goddess of wisdom? What is the Jewish translation of devi for the 21st century? Is it still angel? It takes tremendous effort to not think of G-d as if He were a person (and sometimes too to not think of people as if they were G-d). Carlebach opens his essay stating that Torah is sum total of divine revelation and belief in such a revelation as both possible and necessary, and moreover, as a historical fact. For him this is one aspect of the need to have both revelation and reason – but there are many other aspects to these two poles. God speaks across this bridge of revelation and is met by man’s inner voice and conscious. It is a balance of the divine and the human. For Carlebach, reason is self-evident and sits in judgment on our thoughts and actions but revelation has authority and objectivity – the fate of our ethical-religious existence is decided on the battlefields of this clash. [Notice, that he does not think that we need to capitulate to revelation. ]There is an eternal clash of the revelation of religion and human feeling, reason, and conscience- we are always located in the middle. This is not because of human frailty of inconvenience but from the start of our faith. In the Bible, the demand for absolute obedience and servitude must be seen against the background of antiquity but it was balanced by charity, justice, purity, sanctity, peace. The judgments mishpatim are a form of general morality. And already in the Bible there is protest against sacrifice as obedience without the justice and loving-kindness that God wants. The Rabbis gave us aggadah which was their form of philosophical speculation. Rabbis asked moral questions of biblical character so it shows that they trusted their own hearts and minds to question the Bible. The Rabbis never doubted that they have to conform to universal moral law despite being given a revelation. They saw two types of mizvot, rational ones and hukkim. -Elazar ben Azariah said that the goal of obeying God against one’s better judgment or the need to fight one’s natural drive is only for the hukkim. But Hirsch thought even the hukim can be explained but not readily apparent . (This is unlike mizvot as a yoke as presented by Rashi-irrational or looking for an esoteric meaning like Maimonides.) But unlike Hirsch, tosafot has a concept of mezuveh veoseh– that one is commanded therefore one takes painstaking care . Jewish-Hellenistic authors like Philo of Alexandria or Josephus showed that mizvot followed the moral and utilitarian demands of the natural law. Hellenistic Jews “may seem shadowy and diluted” before the Talmud. But we have to give due to those Hellenistic Jews who wrestled with keeping Jews loyal in the diaspora. We have much to learn from them and their episode in Jewish history. From Saadyah to Abarbanel, “Jewish philosophy in the middle ages is even for us moderns an important laboratory of ideas” The Hellenistic era taught us how to confront popular culture and the medieval era taught us how to confront the philosophic and academic challenges. Hirsch follows Saadiah viewing reason as a companion to religion. Bahye in his Duties of the Heart presented the commitment to reason and piety against mere legal and formal observance is another form of the tension of reason and revelation. In every generation there are those who are mistaken and see no need for philosophy and who are scared of heresy. It is not the great Jewish halakhic authorities to blame since the great halakhic authorities were not hostile to philosophy and science. Philosophy and science are blamed for lack of martyrdom in Spain by Graetz and Baer. After the philosophic era, then kabbalah took over in the 16-18th centuries. Moses Mendelsohnn returned Judaism to science, reason, and humanism, he made Judaism catch up to society in the late 18th century. He is an outstanding symbol of reason and revelation. He is falsely maligned by orthodox who never read him- he accepted pure heteromomous legislation of revelation- the Torah tells us what to do not what to believe. He is the model of the Orthoprax Jew, since he keep his heteronomic practice separate from his autonomous reason. He was only a philosophy of transition and not the birth of modern Orthodox Judaism. In contrast to the Reform position, Hirsch balances heteronomy that the Torah is from God without a denial of the inner autonomous revelation of the ethical self. [This is one of Carlebach’s major points that Hirsch did not advocate following revelation over reason, ethics, and humanism, rather he held onto both.] Hirsch created a fusion of all mizvot into a harmonious ethico-religious system. Hirsch’s emphasis on heteronomy and obedience is more apparent than real because of all the autonomous elements in his system– the role of humanism, the universal, his use of Saadiah, the role he gave to reason, and the inner voice. The rhetoric of obedience was because he was fighting Reform. Carlebach sees mizvot as a partnership of man and God, a dynamic Torah, and that the aggadah of reasons for the commandments and rationality make the heteromous position easier to bear. Reason and revelation, autonomy and heteromomy, obedience and philosophic creativity are not opposites, it is not an either/or choice. Franz Rosenzweig, the great Jewish thinker advocated keeping mizvot based on the freedom of our existential decision; he also accepted a historic view of revelation as part of a chain of tradition. For Carlebach, Rosenzweig’s position is intensely individualistic and his entirely autonomous freedom of decision has many obvious objections from an Orthodox perspective but his approach remains a door open for many modern Jews to keep some attachment to Torah and mizvot without accepting an all or nothing approach. The Modern age gave us a hard won inner freedom that we are not giving up.